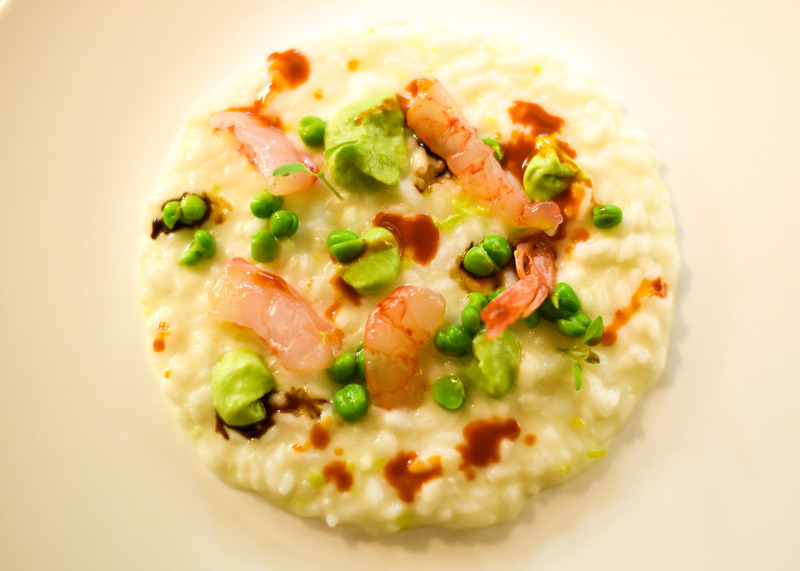 Risotto is one of the most Italian of dishes. It’s origins lie deep in the past, probably introduced to the Mediterranean by Arabs in the middle ages. 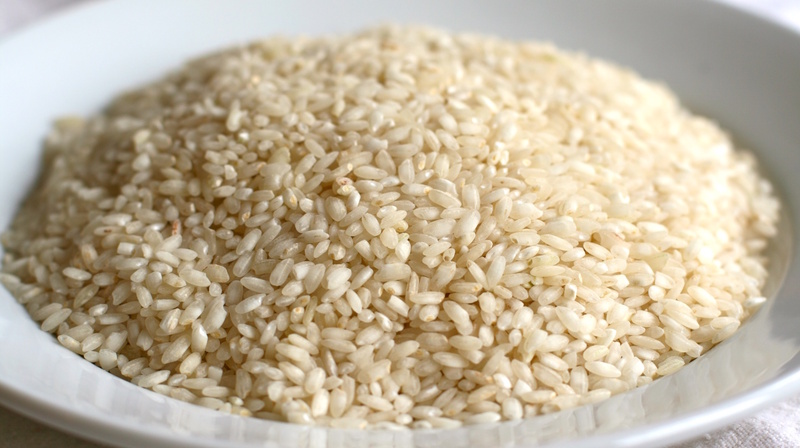 However it was in the fertile plains of Northern Italy, ideal for growing the short-grained Carnaroli and Arborio rice, essential for a good risotto, that it found a true home. 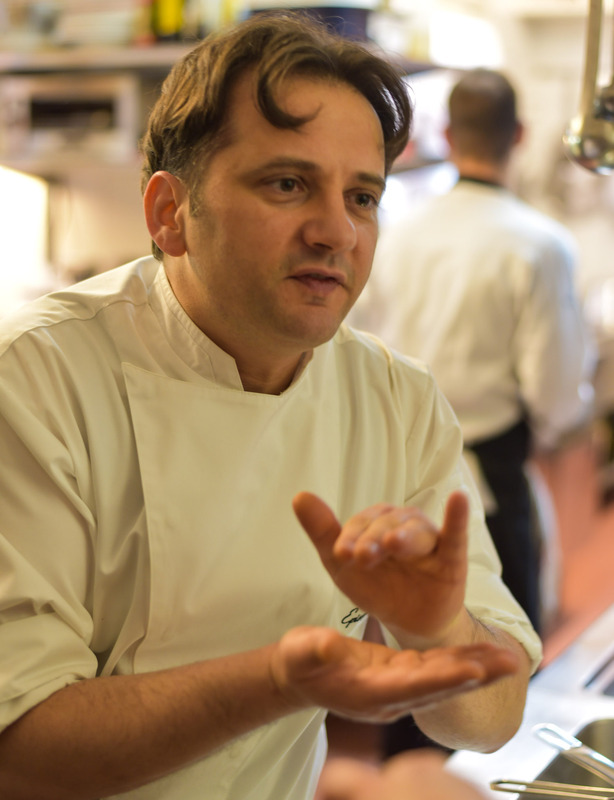 Through to the present day the dish is still built around the same core components: rice, stock, onions, butter, wine, parmesan and sometimes saffron – each region (and most hotels for that matter) having their own special version. 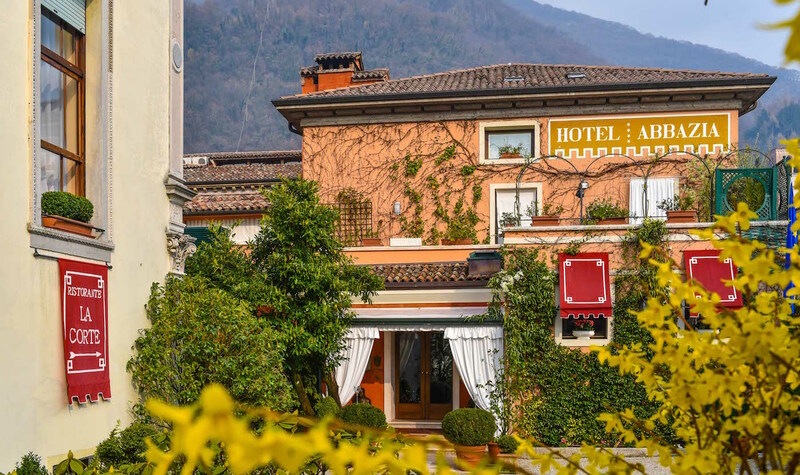 We recently stayed at the lovely Hotel Villa Abbazia (reviewed here) in the Prosecco region of Italy, dining in their exquisite Michelin-starred La Corte restaurant. Shell the shrimps, cut them in half lengthwise and marinate them with sake (optional), olive oil and a tablespoon of cooked wine. Optional – mix the waste prawns (cook them briefly) with the mirepoix of vegetables and cover with water. Simmer gently for a while before sieving off the liquid. Reduce this slowly by at least 50% over a number of hours. In a bowl – ideally in a bain-marie – mix the yolks with a half cup of Prosecco and a spoon of cooked wine. Blanch the peas for 2 minutes in lightly salty water (shelled best but not essential); drain and add shallots which have been sweated in a pan in the butter and add cream immediately. Cook gently for a further few minutes, blend and sift. Save a few peas for garnishing. 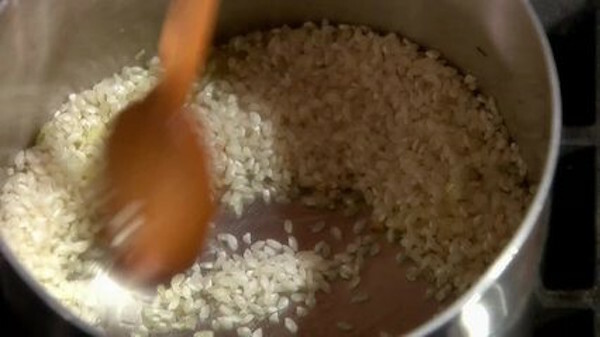 Gently toast the rice for a couple of minutes with some of the oil and finely chopped onion. Blend with a portion of Prosecco, just cover with boiling water from the half litre. Watch carefully, stirring regularly, occasionally adding the remaining water to maintain some moisture. Keep stirring and testing – it’s cooked when the rice is still slightly al dente. Add the remaining Prosecco and some salt, stir in the Zabaglione, Parmesan, olive oil, chives and mascarpone. 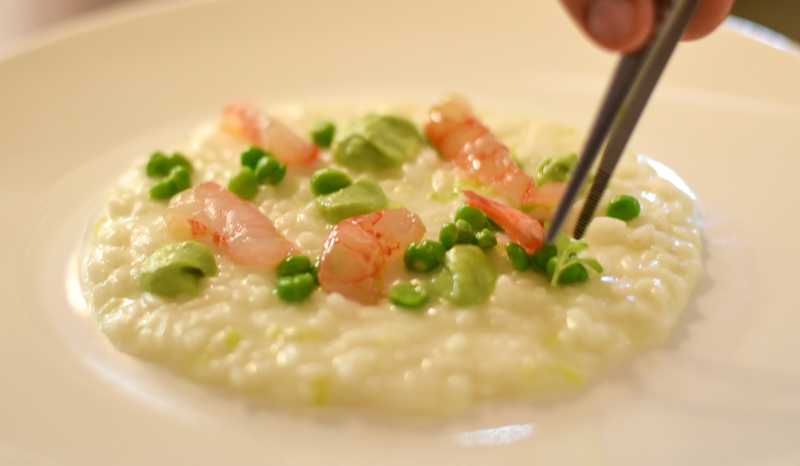 Decorate with the shrimps, dot the pea puree around along with the shrimp/vegetable reduction. 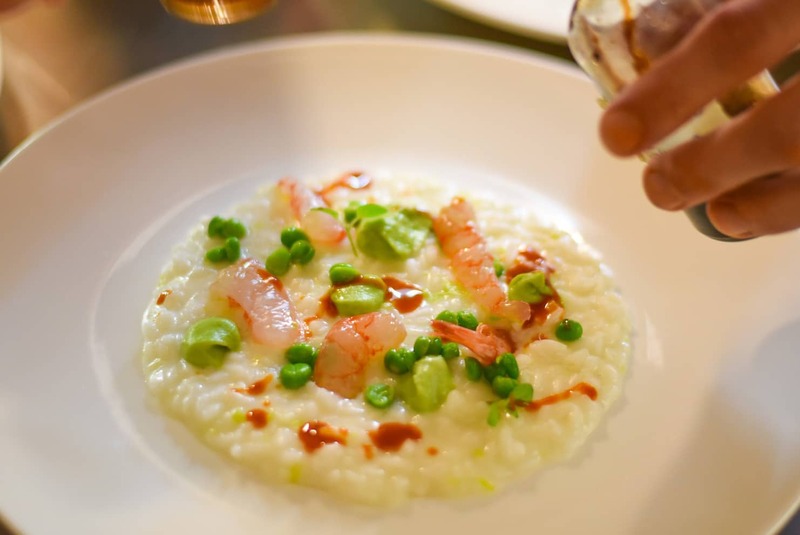 A fabulous rich, moist and exquisitely tasty risotto that you might even choose to wash down with a nice glass of Prosecco. Very Italian – and in this case very Veneto. Grazie Donato! The Hotel Villa Abbazia is reviewed by CELLOPHANELAND* here.